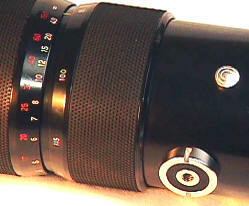 Total production is listed at only 581 lenses, making this one of the rarest Contarex lenses. It is so rare that even a picture is very difficult to find, much less the lens. Two ring zoom. Closest focus a not too macro 3 1/2 meters. Yet, the quality is startling. Complete with caps, pistol grip, rubber shade, and yellow bayonet filter. 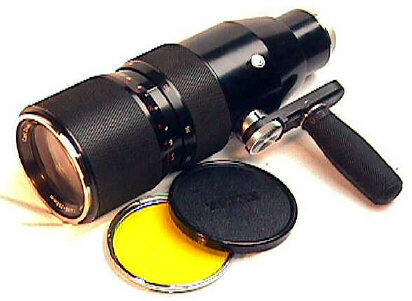 Notice the 96mm front filter and shade bayonet, twin control rings for separate focus and zoom, tripod socket, and the lack of an aperture ring. 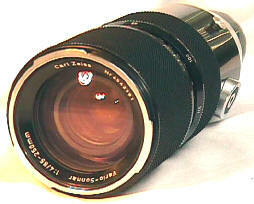 F/stops were controlled on the camera body, much like many of today's AF SLR's. No depth of field markings were engraved on the lens: a separate booklet was provided! !